Aries, think about buying new shoes in March. You will need to move a lot and spring is pounding on your door. For the third month of 2019, horoscope also encourages Aries to forget being shy – look for the sunshine and company. The blessed bundles of photon beams stemming from the nearest star are able to recharge your exhausted mental batteries. March is also the month when Aries may excel at work. You will be able to solve twice as many tasks as you would normally, plus order your inventory to such extent and precision that Amazon warehouses could envy you. According to horoscope March is the ideal time for a change of your hairstyle. Taurus, change the shade, colour, length, shape or simply everything! But remember, hairstyle does not change what's hidden under, that means your mind. The flames of love also seem to be within reach. Therefore, if Taurus feels that her or his heart is like a cold stove, you should write down instructions on what to do when your hormones will reach the boiling point. Naturally, this is only a metaphor. The horoscope simply underlines the talent of Taurus in finding new solutions to old problems, especially those emotionally heartbreaking that are appearing on the horizon. March will seem like an impenetrable web to Gemini. But do not despair. On the contrary, our horoscope may introduce a challenge how Gemini will improve the ability to cope with the increasingly complex world around us. The globe is linked from America to China by invisible threads – from the Internet wires to the subtle fabric of all business contracts. Gemini will find refuge provided by love, family or friends. You will find that the apple grown near is sweeter, even if maybe more expensive, than the one from far east or west. The horoscope also reveals that March 2019 will bring inner pleasure to Gemini, mainly as a result of your noble and honest work; doesn't matter whether you're a night watchman or a local branch Pepsi-co's CEO. Cancer, March 2019 will be the perfect challenge for your back and spine. Literally, but as well symbolically. You should take care of the proper position when sitting at a computer, buy an excellent mattress and above all enjoy some healthy exercise. In figurative sense, Cancer's horoscope encourages to act "straight" and do not bend your back to please others. In March, your self-confidence and willingness to hold and defend your own opinions will rise. Despite the fact, that they do not always match the demands of friends or superiors. Horoscope says, be fearless and do not let others to manipulate you. In return, Cancer, share your freedom. If someone wants to go against the wall, let him or her go. Important is, that such silly person doesn't go against you. Although you are the "king of animals", Leo should realize that one is learning all his / her life and thus you are a beginner all the time. Even if you are 50, you may decide to start studying neurochemistry, equestrian psychology, horology or viticulture. But it does not mean anything to you? Do not mind, and do something simpler, for example gardening. The March Horoscope simply encourages Leo to learn anything new (we suggest nature and people as the main motives of interest). Whether you want to knit a sweater with your own hands, prepare a home-made herbal potion or just plan a trip to the Moon, you have all the prerequisites to succeed. To be more precise, Leo will start successfully. A trip to the Moon and back is maybe too bold for March, but where there is a will, there is a way. Watch out for forgetfulness. In March, Virgo can forget the keys, the wallet, but also the fact that you have a family and good education. The horoscope admits that Virgo may easily get "second wind". Virgo starts to be attracted to broader society, improvisation and exotics (and sometimes even eroticism). 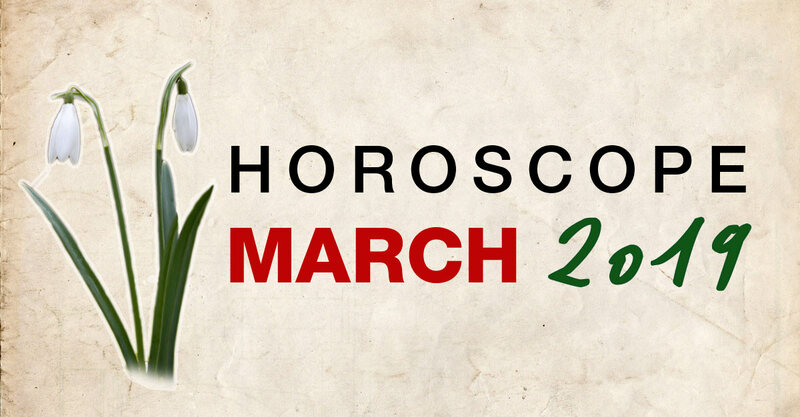 March is a month of bold anticipation for all people born under Virgo; it seems to be a great challenge especially in the area of love and travel. You do not want to restrain yourself, although Virgo is otherwise a conservative sign of the zodiac. The third month of 2019 will bring important encounters and new shaping experiences that will affect Virgo for a long time. Horoscope tells us that computers have their updates and upgrades, while Libra simply needs to restart the mental system in March. If you have children, Libra can be 100% sure that they will cause similar burden, as if you were carrying heavy bags of cement somewhere on a building site. In other words, do not wait for relaxing with the Sacher cake and Viennese coffee too often, but rather get ready for Libra's thorough endurance test. The closest people (children and relatives) will cause the overheating of brain cells rather than any harmonious solution the problem. Libra, it may be difficult, but at the end of the month you will find that you are surprisingly stronger and more resilient than at the very beginning. Scorpio, do not let yourself be captivate by a stream of thoughts or fantasies. The horoscope suggests that love or impulsive feelings can take precedence over your decision-making. Of course it is often a wonderful experience to be carried away by the "here and now" atmosphere. Scorpio simply likes to act sincerely in every moment. But you should avoid hasty (from intuitive to impulsive) decisions that lead to remorse, especially when concerning your distant future, long-term savings or other actions that affect others permanently. March 2019 is awesome, because it allows you to experience your feelings deeper than before. The doors of the universe are wide open. Scorpio, just be careful and do not forget the usual life on the planet Earth. The right size is the key. Sagittarius should keep in mind that a fancy dress is good for a fairy tale, but you need a garment that fits exactly to your character. Why? Because, according to the horoscope, your clothes, visage, scent and the overall appearance will be more important than ever. Especially as a subliminal means of communication when Sagittarius wants to be silent but still tell others what he or she feels. In March colour may also outline the mood that Sagittarius will change relatively often. However, your sensitivity to subtle shades and their combinations will be outstanding. Thus, responsive, emotional or people in love will keep Sagittarius under surveillance. Capricorn's horoscope urges him / her to forgive and to abandon retaliation. If someone scratches your car while parking, such villain could be beheaded immediately; of course only if you were the only judge. But be sure that the world would not be better. Likewise, neither a sarcastic friend nor a vigorous mother-in-law should cover the whole March with black clouds. It's just not worth it. The horoscope says: Capricorn, hug and forgive to others wherever it is possible. Walking along the lake, accompanied by bird's singing, that is definitely a better tip for spending your free time than argue about politics or be stuck in the crowd while hunting spring discounts at the shopping centre. Rather mother nature will encourage Capricorn and shows him / her a welcoming face. Beware of a broken tire. Aquarius, in the third month of 2019 you will certainly not lack courage. But you should anticipate the volatility of luck and be prepared that even modern technology may disappoint you at the least appropriate moment. Do you have an appointment? The horoscope strongly encourages: Do not forget to plan ahead – to always arrive on time; even if there will be a traffic congestion, or if the weather goes mad, or if your digestion turns into your worst enemy. Excuses won't help. And love? According to horoscope, Aquarius will be emotionally exhausted. Taming a wild beast or extracting hippo's teeth can be much easier than agreeing on what movie to choose, not to mention deciding the best colour of the new living room. Pisces, the horoscope for March forecasts a number of errors that you will encounter and which will not be pleasant at all. Anyway, the third month of 2019 is the growth one, thus be sure you are slowly achieving your goal, step by step. Only here and there may Pisces get lost at high tide of the internet search engine or will miss the target even with the help of GPS navigation. But we see a green light in career prospects by all Pisces. And love? Loving beings will notice that your pure feelings are like a clear mountain lake that clearly reflects the sun and the sky. According to horoscope, Pisces will be an ideal object for seduction or romp ... in two (and, exceptionally, even more).